You can register at any site listed below for continuing education classes. Emergency Services class registration is site specific. Review the online schedule to find the course number and title of the class that you want to register for. Payment by phone requires a Visa, MasterCard, American Express, or Discover, so please have your card ready. Some courses may require additional form paperwork and/or pre-requisites. Please refer to the course description or information packet provided in the online schedule for details. M - Th: 7:30 a.m. - 5:00 p.m.
F: 8:00 a.m. - 3:30 p.m.
M - Th: 8:00 a.m. - 5:00 p.m.
M - Th: 8:00 a.m. - 7:00 p.m.
M - Th: 8:00 a.m. - 4:30 p.m.
F: 8:00 a.m. - 3:00 p.m.
You can register for most classes through WebAdvisor. For more information on WebAdvisor, visit the FAQ tab located on the left navigation bar or view the step-by-step instructions. Only select courses offer the deferred payment plan. If a course offers this feature a note will appear in the online schedule. Sign up for a payment plan with NelNet. Payment of 25% of charges will be drafted upon completion of payment plan application. Print out your payment agreement. Students should use their Social Security Number when asked to input their student ID. Register for your class at Lee, Harnett or Chatham Main Campus. 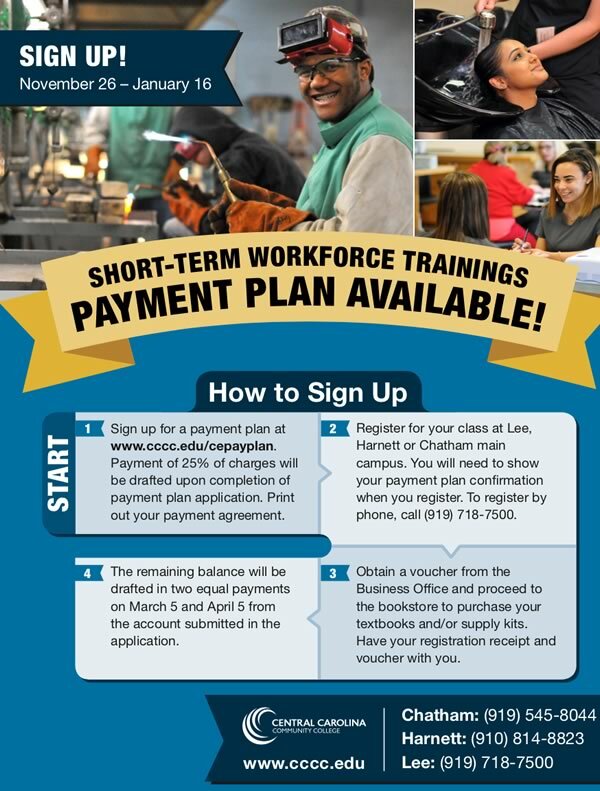 You will need to show your payment plan confirmation when you register.​ To register by phone, call (919) 718-7500. Obtain a voucher from the Business Office and proceed to the bookstore to purchase your textbooks and/or supply kits. Have your registration receipt and voucher with you. The remaining balance will be drafted, in two equal payments on March 5 and April 5 from the account submitted in the application. For registration questions or assistance, call (919) 718-7500.